Welcome to Hawai'i, a.k.a the Big Island, a.k.a the Orchid Isle. You probably landed in either Hilo or Kona, and because we can't begin our tour from both places, we'll start this guide in Kona and proceed counterclockwise around the island. (If you landed in Hilo, just flip ahead and start from there.) The only other way to travel between Kona and Hilo is the rough Saddle Road, which many car rental agencies consider off-limits. The Saddle Road is currently being upgraded, however, and some car companies now permit travel over it. At just over 4,000 square miles, Hawai'i Island is the largest of the Hawaiian Islands. At less than half a million years old, it's also the youngest, a place where the volcanic hotspot that created the rest of the chain is still adding new real estate. (In about 100,000 years, when the Lo'ihi seamount off the southeast coast of the Big Island breaks the surface of the Pacific, Hawai'i will lose its status as the youngest island.) Comprised of five shield volcanoes (Mauna Kea, Mauna Loa, Kilauea, Hualalai and Kohala), Hawai'i Island is a place of extremes: the barren lava deserts of Kona to the verdant rainforests of Hilo, the snowy summits of Mauna Loa and Mauna Kea to the sun-scorched plains of Ka'u. It's a place where fire meets water: The lava flow from Kilauea, which began its current eruption cycle in 1983, meets the ocean at the southern end of Hawai'i Volcanoes National Park, sending a plume of steam into the sky. It's a place of superlatives: the world's tallest mountain, the world's longest lava tubes, the country's biggest island, the world's clearest night skies. It's a place of strange and magnificent landscapes, a volcanic wonderland that will inspire and amaze you. The district of North Kona is the busiest area of the mostly sleepy Big Island; it's the site of the biggest airport, most of the major resorts and the quaint seaside village of Kailua-Kona. Until the nineteenth century, Kailua was a fishing village; later Kailua served as a harbor for exporting cattle, coffee and sugar. The town itself had always been a sleepy village; up until the early 1970s the population was no more than 700. Today it's around 40,000 and growing. Now Kailua is the epicenter for Big Island tourism and Kona coffee, and it's not unusual to see giant cruise ships anchored in its small bay. Kailua town is home to a number of historical and cultural sites, many relating to the ali'i nui, or monarchy, of old Hawai'i. Beside the Kailua pier is Ahu'ena Heiau. This comparatively modern temple (built in 1817) was dedicated to the patron deities of learning, the arts and healing. King Kamehameha I also made his home here; he could maintain control over traffic in the bay and monitor farming activity. Stroll along Ali'i Drive, the coastline road through Kailua, for both shopping and historical sites. Moku'aikaua is the first Christian church built by missionaries in Hawai'i in 1820. Across the street is Hulihe'e Palace, a nineteenth-century vacation home for the monarchy. Hulihe'e was built in 1838 and recently restored; today it's a museum open to the public. Throughout the week, keiki (children) practice hula in the courtyard under the shade of giant banyan trees. At the northern end Ali'i Drive in Keauhou is a remarkable heiau complex that's currently under reconstruction; the 600-year-old Hapaiali'i Heiau served as a solar calendar, and at high tide it's completely surrounded by water. Kailua town isn't noted for its beach action; there are very few sandy beaches in Kailua itself, and the Big Island as a whole has fewer beaches than the older islands. But a short drive north of town on Queen Ka'ahumanu Highway past the Honokohau Small Boat Harbor takes you to the beaches of Makalawena and Mahai'ula, which require a short hike to access. Within Kailua town itself, though, are Kahalu'u Beach Park and Magic Sands along Ali'i Drive. There's ample parking at both, and you don't have to hike to them; the tidepools at Kahalu'u Beach Park offer some of the safest and best snorkeling on the island (you're almost guaranteed to see honu (sea turtles) lazily swimming among the coral). Holualoa is well worth the fifteen-minute drive from Kailua. Days pass slowly in the artists' retreat town, almost like the gentle breezes wafting through the coffee groves on the slopes of Mount Hualalai. Steeped in natural beauty, this upslope coffee town blends modern art with simple country living. The village's many private galleries showcase the work of local artists in a variety of media, and a number of small coffee shops and bistros serve superlative Kona coffee. There is perhaps no other region on the Big Island more historic than the district of South Kona. 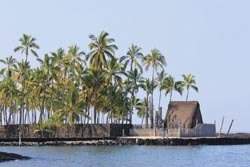 Whether it's the origin of Kona coffee, the ancient Hawaiian sites at Pu'uhonua O Honaunau (Place of Refuge) National Park or the Painted Church overlooking Kealakekua Bay-where English explorer Captain James Cook met his fate-South Kona will keep the historically minded visitor busy. 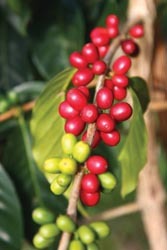 Coffee first came to Kona in 1828, when the Reverend Samuel Ruggles brought plant cuttings to Kealakekua. Japanese immigrants cultivated many of Kona's first farms and engineered the system of milling and processing coffee; you can experience that history firsthand at Greenwell Farms in Kealakekua, which is both a working coffee farm and living history exhibit. 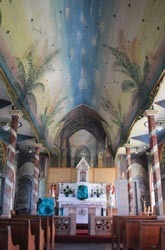 On highway 160, among the coffee farms on the slopes above Kealakekua Bay, is the Painted Church, where between 1899 and 1904 Father John Velge, a Belgian missionary, painted images depicting biblical scenes of heaven and hell on the interior walls of the church. At the bottom of Napo'opo'o Road is Hikiau Heiau at Kealakekua Bay; the white obelisk marking the spot where Cook was killed in 1779 (that spot is still British territory today) is visible across the bay. A coastal road connects Kealakekua Bay to Pu'uhonua O Honaunau National Park. In ancient Hawai'i, people who broke kapu (sacred laws) would flee to places of refuge; if they could reach this sanctuary, their lives would be spared. Today visitors can see loko (fishponds), hale (thatched roof homes), heiau (temples) and rock walls as well as demonstrations of ancient Hawaiian crafts such canoe building and ki'i (tiki) carving. Kealakekua also has one of the most popular beaches on the Big Island; it's not a sandy beach (it's a shelf of smooth lava), but the water's calm, there's excellent snorkeling and a resident pod of dolphins can be seen almost every day. Arrive early, as parking is sometimes a challenge. The Ka'u district is a sparsely populated and wild area stretching from South Kona to Puna. It's an agricultural area, primarily (it was once a sugar cane producing area, and it's now home to a nascent coffee industry), but there are a number of fascinating natural features, including a massive lava tube system in the deserts of Ocean View and a giant pit craters, formed when a lava tube collapses, filled with native plants. The spot where Polynesians first set foot in Hawai'i will always remain a mystery, but it was probably somewhere near Ka Lae, or South Point. When sailing north from anywhere else in Polynesia (the Marquesas Islands being the most likely point of origin), voyagers would likely have spotted the Big Island first, and South Point would have been the nearest landfall. There's archeological evidence supporting that theory: Lava tube excavations near Ka'iliki'i and Wai'ahukuni suggest that people were using them by 750 AD, and other evidence indicates that people were in the area as early as 200 AD-about the time the islands were thought to have first been settled. Ka Lae today is a wild and intense place, as befits the southernmost extreme of the United States. Fishermen today moor off the cliff near South Point Park, which is a rich source of fish. The cliff rises about forty feet high and goes down another thirty feet below the surface of the water. Ladders hung to make access to the boats easier swing freely in the air just above the sea. While it's tempting to leap into the water and climb back up the ladder, don't try it-the swift longshore current can drag swimmers straight out to sea. It's called the Hala'ea current for a chief who was carried by it to his death. One of South Point's scenic spots is Mahana Beach, also called Green Sands Beach for its distinctive golden-green color. The grains of green sand are olivine (also called peridot, though the sand isn't gem quality). Up the coast from South Point's main town, Na'alehu, and heading toward Hawai'i Volcanoes National Park, you'll pass by Punalu'u black sand beach and later a sign marking the road to Pahala. The short drive to Pahala is worth the excursion. There are the remains of the old Pahala Theater and a community supported by macadamia nut farming as well as scores of small family-owned coffee farms on the lush hillsides. Many of the homes date back to the early twentieth century, including the two-story plantation manager's home, which is now a museum. Pahala is a great place to get a glimpse of life on a sugar plantation a hundred years ago. Take time to drive into the lush Wood Valley and to a Buddhist temple. Welcome to Madame Pele's house. Hawai'i Volcanoes National Park has one entrance off Route 11, thirty miles south from Hilo or ninety-five miles southeast from Kona. The park is open twenty-four hours a day all year round (though the roads within the park might sometimes be closed because of volcanic activity). If you enter the park after hours, you may pick up a brochure and map at the Kilauea Visitor Center located a quarter-mile from the entrance on Crater Rim Drive. Carefully read the park regulations and guidelines; the volcano fumes can be dangerous to pregnant women, infants and people with heart or respiratory problems. People at risk should avoid Sulphur Banks, Halema'uma'u Crater and other areas where volcanic fumes are present. Overnight trips in the park require a backcountry permit that you can obtain free at the Kilauea Visitor Center. To learn about the park's volcanic activity and history, visit the Thomas A. Jaggar Museum on Crater Rim Drive; also of interest along Crater Rim are the Volcano House, Thurston Lava Tube and many scenic vistas. The highlight is, of course, Halema'uma'u, the active crater at the top of Kilauea. Depending on when you visit, you might have a chance to see the volcano erupting. A forty-five-minute drive to the end of Chain of Craters Road and a short hike will take you to the most recent lava flow area; the best time to view lava is at sunset, when the red glow stands out against the darkening sky. 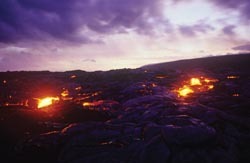 Be sure to bring a flashlight to negotiate the rough lava on the return hike. Also be aware that this new coastline is unstable and could collapse at any time without warning. The park also offers many other hiking opportunities, which are mapped out in the park brochure. A favorite is Kilauea Iki; this easy, four-mile hike takes you across a frozen lava lake and through native 'ohi'a forest, where you can also see native forest birds. A reminder: please drive carefully while touring the park so as not to hit the nene, the Hawaiian goose. The residents of the Puna district sometimes brag that of all the six Big Island districts, theirs never submitted to Kamehameha the Great's rule; Puna remained independent while the warlike king went on to conquer the rest of the Big Island and the other islands. Puna today still retains a sense of that separateness and ruggedness; it's a place most visitors pass through rather than explore, though there's tremendous beauty here. If you want to experience the feeling of old Hawai'i, Pahoa retains a sense of its past. First a rugged sawmill town, then a sugar town and also a crossroads on the old railroad, Main Street Pahoa has maintained its old West-style storefronts and wooden boardwalks. The town is home quaint shops-from surf to curio-and restaurants that span the ethnic flavors of the globe. Also located in Pahoa is the Akebono Theater, Hawai'i's oldest theater. The Puna countryside is filled with natural wonders like the Lava Tree State Park, steam vents, groves of papaya, warm springs (visit the ponds at Ahalanui) and black sand beaches along the rugged coast. The town of Kalapana, which was mostly buried by lava in 1990, is at the southwestern end of the Puna district and offers a surreal look at the risks of living in the shadow of an active volcano. At the corner of Pauahi and Kamehameha Highway you'll see the statue of Kamehameha the Great, placed here because you're standing on his father's land. 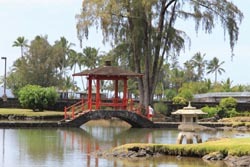 Nestled among royal palms and behind is the mouth of the Wailoa River, with its winding waterways and a fishpond. You're in Hilo town, the second largest city in the Islands. Downtown Hilo is both quaint and urban, with a number of good restaurants and a farmers market (Wednesdays and Saturdays) along a section of the main road locally called "Front Street" (actually Kamehameha Avenue). But there's also a wealth of natural beauty nearby. 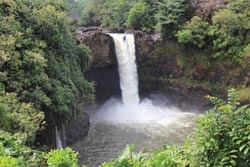 An easy-to-find waterfall is Rainbow Falls, located along the Wailuku River at the north end of town. If you're lucky you will see the rainbow for which it's named arcing over the falls. Accommodations in Hilo town are few; apart from a couple of hotels by the water, your best bet is the b&bs, some of which are hidden away in beautiful jungle locations. The drive north from Hilo takes you over scenic gorges once crossed by cane-hauling trains in the heyday of sugar. The waterfalls and the river mouths under the bridges on the road leading north up the Hilo coast are awesome sights. Take the four-mile scenic coastal route off the main highway to pass Onomea Bay. The lush ravines and botanical gardens are well worth the detour. The village of Honomu and 'Akaka Falls State Park can be reached by taking Highway 220. Once you reach the park, a short paved trail will take you past a network of small waterfalls and colorful foliage to a lookout where you'll see 'Akaka Falls plunging 422 feet to a pool below. The Hamakua coast, once among the most productive sugar cane growing regions, is today home to a small-scale agricultural revolution. Small farmers are growing an enormous variety of crops, some of them exotic and even almost unheard of in the United States. If you see it at a Big Island farmers market, there's a good chance it was grown somewhere in Hamakua. In the early twentieth century, it was quite a trip across the coastal ravines to get to Honoka'a, which was the third largest city in the Territory of Hawai'i. From Hilo, vacationers and soldiers on leave would travel up the Hamakua coast to Honoka'a, where nightlife was king. A dance hall was built above the Botelho building, which housed the first car dealership in the town. Now there's a curio and antique shop, but one can easily imagine what a Friday night might have been like at the Botelho in the 1940s. Many of Hawai'i's old theaters are being restored, and the historic People's Theater of Honoka'a is no exception. The theater shows feature films every Friday, Saturday and Sunday evening. If going to a movie isn't on the itinerary for your Hawaiian vacation, go for the nostalgia, which is definitely present once you're inside the huge old movie hall. North of Honoka'a is Waipi'o Valley, a dramatic and storied landscape. Legend has it that it was in Waipi'o Valley, "the land of the falling water," that King Kamehameha I received his leadership training and learned to surf. Today a few family homes still dot the area, which is bisected by a river. Local farmers continue to farm taro and fish along the shore of this peaceful and remote valley. The valley can be accessed only on foot or horseback, and several tour operators on the Big Island offer excursions above and into Waipi'o. Outside of Waipi'o Valley and Honoka'a are other early and small settlements of the Hamakua region, such as Pa'auilo, Kukuihaele and Laupahoehoe. These towns are all filled with the rich and local culture that happily survives in this region of the Big Island. Between snow-capped Mauna Kea and the Kohala mountains, the green hillsides of North Kohala roll under wispy white clouds, and afternoon rainbows frequent the skies above Waimea. Herds of cattle graze in sloping pastures filled with cactus and dry brush as Hawaiian cowboys work the range on horseback. Ranching began here after King Kamehameha appointed a young seaman named John Parker to thin the herds of wild cattle that had grown uncontrollably since Captain George Vancouver brought a few head as gifts to the king in 1793. Parker managed to domesticate a herd of his own before marrying a Hawaiian chiefess. The marriage gave Parker the land he needed to found the 250,000-acre Parker Ranch in 1847. Today the town of Kamuela, more often referred to by its district name Waimea, remains immersed in the ranching lifestyle. The brightly colored Victorian houses and shops, tidy yards filled with flowers and the skeletal remains of wagons give visitors the opportunity to see yet another aspect of the diversity of cultures that exist in Hawai'i. Being close to the big resorts in South Kohala, Kamuela is surprisingly cosmopolitan, with a number of top-flight restaurants and even its own symphony orchestra. Following highway 270 north, visitors will encounter a landscape filled with historical landmarks including the original King Kamehameha statue, Kalahikiola Church and Mo'okini Heiau, which is regarded as the oldest pre-Western contact temple in Hawai'i. King Kamehameha is believed to have been born at Mo'okini in 1758. Also in North Kohala are the remnants of a once-thriving sugar industry of the 1880s, which are still visible in the old storefronts of Hawi and Kapa'au. Highway 270 leads through North Kohala's fertile pasturelands, forests and ultimately to Pololu Valley, which offers one of the best scenic lookouts on the island. If you plan to hike into Pololu and beyond, be ready for a trek. The trails are narrow, steep and slippery and should not be attempted by novice hikers. If the skies are clear in North Kohala, you might catch a view of Maui to the west. Between December and April, you're almost guaranteed a humpback whale sighting off the coast of North Kohala. Almost always under sunny skies, the Kohala coast is a tropical playground. It was once a retreat for Hawaiian royalty, and today it's the site of luxury resorts and spas sprawling through the otherwise barren lava fields: The Four Seasons Hualalai, the Mauna Lani, the Fairmont Orchid, the Hilton Waikoloa and the Mauna Kea Beach Hotel. There are a number of historical sites along the Kohala coast, and one of the country's best beaches is at Hapuna Beach State Recreation Area. Hapuna's long, white sand beach, rolling surf, clear skies and accessibility make it a popular destination. There are several renowned championship golf courses. Seen from a distance or from the air, the green fairways stand out in stark and beautiful contrast against the black lava. Connecting this forty-plus-mile coastline is the King's Trail, an ancient road used by ali'i and by runners who transported pond-raised fish wrapped in ti leaves to the tables of Hawaiian royalty down in Kailua-Kona. Today the King's Trail passes through several resort properties, through Pu'ukohola Heiau and scores of petroglyph fields. The impressive Pu'ukohola ("whale mountain"), now a national park, was the last Hawaiian temple built during King Kamehameha's reign. A popular trail for viewing ancient petroglyphs starts near the King's Shops on Waikoloa Beach Drive. A massive ancient fishpond system has been restored on the grounds of the Mauna Lani resort, which is worth a visit. The infamously rough, rutted and twisting Highway 200 traverses fifty-three miles between the Kona and Hilo sides of the island; traffic is usually commercial or military, there are no towns, services or gas stations, and many rental car agencies forbid drivers from traveling on it. But the adventurous will be rewarded (not least by the shortest route between Hilo and Kona). From the Kona side, the road rises through ranch lands filled with wild turkeys, francolins, wild donkeys and, if you're lucky, the pueo or native short-eared owl (which is active during the day). If you're in a four-wheel drive vehicle, you can turn off at the Mauna Kea Access Road and drive to the top of the tallest mountain in the world (bring a jacket-it's usually extremely cold at 13,796 feet). You'll see the seven astronomical observatories at the summit, built there to take advantage of what are some of the clearest night skies on Earth (the public is not permitted inside the observatories). If you're not in a four-wheel drive vehicle, do not attempt to reach the summit. Instead stop at the Ellison Onizuka Center for International Astronomy at 9,300 feet, where on any given night amateur astronomers come to set up their telescopes and stargaze. 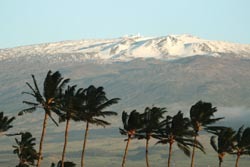 Several Big Island operators offer Mauna Kea stargazing tours, which is often the best way to visit the summit of the mountain. Continuing on Saddle Road, you'll pass through the Pohakuloa training area, where you might get stuck behind armored personnel carriers. Twenty-two miles west of Hilo at about 6,000 feet, you'll come to the Pu'u O'o trailhead. This easy trail winds through high-elevation koa and 'ohi'a forest, where birdwatchers will be able to view some of the most endangered birds in the world up close. 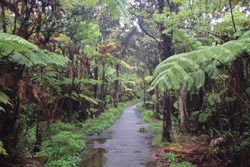 Along the trail are several kipuka, or protected forest areas, filled with remnants of native forest. Walking through one is as close to "the real Hawai'i" as most people will ever get.